Met a girl crazy for you or met a boy who’s cute as can be? Then wedding bells may be in your future. The weather is warming up, birds are chirping, the flowers are blooming, and your friends are all getting engaged. 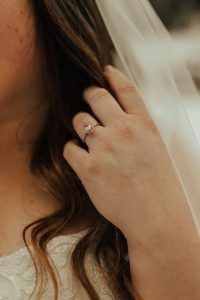 Whether you are looking for new Pinterest photos for your “Future Wedding” board, shopping for a soon to be fiance or starting to look at rings together, it is good to know what some of the popular and trending engagement ring styles are in your area. 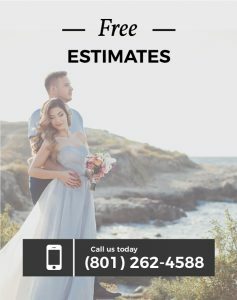 Steadman’s Fine Jewelry in Salt Lake City is a local jeweler dedicated to finding and creating exquisite and unique engagement rings for every couple. They also create and design wedding rings, wedding bands, stackable rings, and more custom jewelry. 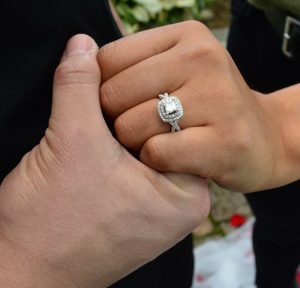 At Steadman’s Jeweler, we have chosen a few of the most popular and on-trend engagement rings, to inform and inspire you for that perfect ring. Finding the right ring is like “saying yes to the dress,” it has to feel right and be perfect for you. 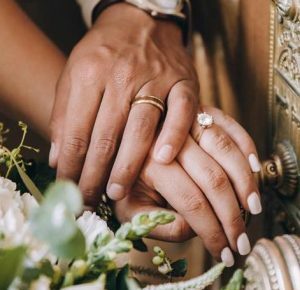 There are so many engagement ring settings, diamonds, jewels, finishes, and prices that it can be overwhelming to find a starting point. From glamorous and flashy to sophisticated and simple engagement rings. 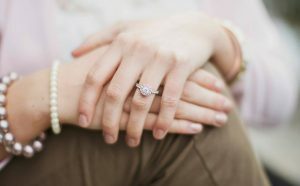 We have found a few of the trending engagement rings and styles around Salt Lake City to help you with your search. The first is a halo engagement ring. A halo ring setting can be any shape that you desire, with the beautiful center stone and smaller stones around it. We see diamond cuts from emerald, cushion, princess, and oval all with a beautiful halo setting. This is also a great setting to help make the center stone look larger than it is by surrounding it with smaller diamonds your ring will look amazing. One of our favorite cuts this year has been the princess cut engagement ring. This is a thick and jaw-dropping stone that will look amazing in any setting. It is beautifully surrounded with smaller gems in vintage setting but could look just as amazing on its own in a solitaire setting. Lastly, our favorite trend this year has been the rose gold engagement rings. With so many beautiful styles, it is the cherry on top to choose rose gold as your metal. This photo is a rose gold oval halo engagement ring. There are so many ways to incorporate a stunning rose gold design for your future engagement ring. Check out these sites for more info on choosing the perfect ring for you or stop by our store as your local jeweler.